This is almost incredible, but the proof of its truth is in the video at the top of this story. The entire video was shot in 4K with a DJI Osmo camera and posted on location in 4K using an Apple iPad loaded with at $20 piece of software called LumaFusion made by Luma Touch. LumaFusion was produced by the original creators of the award-winning Pinnacle Studio App. On May 25th, when Josh Turchetta strode onto the grounds of “Pandora – The World of Avatar” during their grand opening inside Disney's Animal Kingdom theme park at the Walt Disney World Resort near Orlando, Florida, he carried in his small production kit the 4K capabilities that only a few years ago would have taken up multiple high tech bays in an advanced Hollywood post house, and perhaps a decade ago would have stretched even their capabilities. Turchetta has a multi-decade history as a director, editor and producer for several of the top entertainment companies in the digital creation industry including working with the Disney company on several shows for the D23 Official Disney Fan Club Channel. But all of them were completed on traditional, desktop post production systems which has given Turchetta plenty of experience working on the kind of conventional NLE’s with which most of us are familiar. Then when a travel company called MEI Travel contracted him to cover the opening of “Pandora – The World of Avatar”, he wanted a Steadicam look to the video, but didn’t want to carry a lot of equipment through the park, so he decided on a much less obtrusive DJI Osmo with its hand-held 3-axis stabilization mount. He also wanted to turn the project around on site, and after some extensive online research about mobile edit software, some costing well over $100, came across the LumaFusion system from Luma Touch. Like anyone, he was skeptical about its $20 price. But, as he told me during our interview, that changed quickly when he tried it out. Because this article is going to be filled with superlatives, I intentionally pushed Turchetta for details, with the understanding that I personally have no dog in this hunt, and I know that Turchetta does not work for Luma Touch. He did some apples-to-apples tests with it against his very mainstream desktop system that is running on a Mac Pro tower with 6 terabyte RAID storage and 64 GB RAM. He took an iPad loaded with the same software and the DJI Osmo camera to Orlando, shot 5 days of footage in the Pandora park, and finished the project before leaving for home. 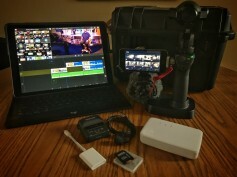 For storage, he cleared off the iPad and kept his footage on 64 GB Osmo SD cards, importing only the material he needed for a specific sequence using a USB Memorex AirStash card reader. In effect, this gave him unlimited storage, even with 4K source material, as long as he did not run out of SD cards. “I was working on several projects simultaneously, but I think I shot about 40 GB of footage specifically for Pandora, maybe 50,” he recalls. Using pre-built Adobe Photoshop graphics he said it was easy to overlay the .png files into the software. LumaFX costs an additional $2.99 on the App Store. 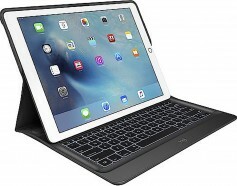 Coming from a traditional NLE background, Turchetta was accustomed to keyboard editing in addition to mousing around, so he connected a backlit Logitech Create keyboard to his iPad. Add a keyboard, and you are no longer restricted to mouse editing. Just a week before our interview, Turchetta had completed a project at the Children’s Hospital of Orange County in California and he found it handy that when observers wanted to see what he had shot he could simply take the SD card from his Osmo camera and pop it into his iPad to display the footage on set in 4K. Turchetta's production equipment for a 4K remote shoot. Click to enlarge. Turchetta has even demo’d the software to friends on his iPhone. Terri Morgan, who co-founded the Luma Touch company with Chris Demiris, told me the software has been on the market for over a year and has gathered a growing community of users. Because storage on an iPad is always going to be a challenge, she described the software's space-optimizing feature called Project Archive. You can also store your source footage on the Apple iCloud, but not everyone wants to mix their client’s video with their kid’s photos and let Apple manage it. I also asked Terri Morgan about output options. “You can master your project up to 4K resolution at 100 Mb/sec with MPEG 4 or QuickTime wrappers using HEVC or H.264/H.265 codecs,” Morgan said. “Chris and I spent 3 years developing LumaFusion, and our passions lie with professional level products. Just wait ‘til you try its color correction and audio keyframing capability." What would be nice is an option for export and import of (FCPX) xml files! Than you can connect it to other NLE’s. Will this be a future option? I’m told by the Luma Touch support team that they are currently working on XML export for FCP, Premiere Pro and other editors. Their current plan is to release this feature as part of a Pro pack in LumaFusion 1.8 later this fall (the Pro Pack will be an additional one-time in-app purchase, and will also include external monitor support for preview, and a number of other high-end editing features). Limited XML import is also planned, though it may come later (hopefully by NAB next spring). Thanks for the extra info Jay Ankeney. 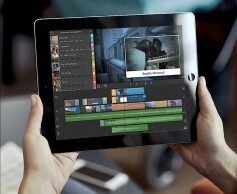 It sounds very promising and can be an addition for every editor who can do some pre-edit on an iPad. Looking forward to this update!